On 14 February 2017, the Centre welcomed Anouk Busset (University of Glasgow) to discuss ‘Crafting Christian Landscapes: Early Medieval Stone Sculpture in North-Western Europe’. In this seminar, she discussed several case studies from her PhD research, including two from Sweden, two from Ulster, and one from Strathmore. She related each site to the theme of movement and discussed how the early medieval stones created sometimes wide-ranging connections. Below is this listener’s summary of the lecture. In her first case study, Anouk discussed three of the seven runestones found in the area of Broby Bro, Sweden. The inscriptions found on these three runestones indicated that they were all connected through a woman named Estrid, her husband Östen, and their children. Anouk discussed how each of these evoked movement through their inscriptions. On one, Estrid dedicated a stone to her husband, which states that he went to Jerusalem and died in Greece. Anouk said that one of the current interpretations of this inscription is that the specific mention of Jerusalem might mean that Östen had been on a pilgrimage (and perhaps that Estrid had gone with him.) A stone erected by her children in her husband’s memory states that they built a bridge; this stone, even with only its own inscription, elicits images of movement. While these stones were located in a very small area, they created connections with distant places through the individuals to whom they were commemorating. Anouk also discussed several other stones in Snåttsta and Hillersjö, Sweden that were erected by family members who lived a great distance apart and referenced each other in their inscriptions. Anouk then focused on two of the ecclesiastical sites situated in the Inishowen Peninsula, an area which, during the early medieval period, within the realm of the Cenél nEoghain. 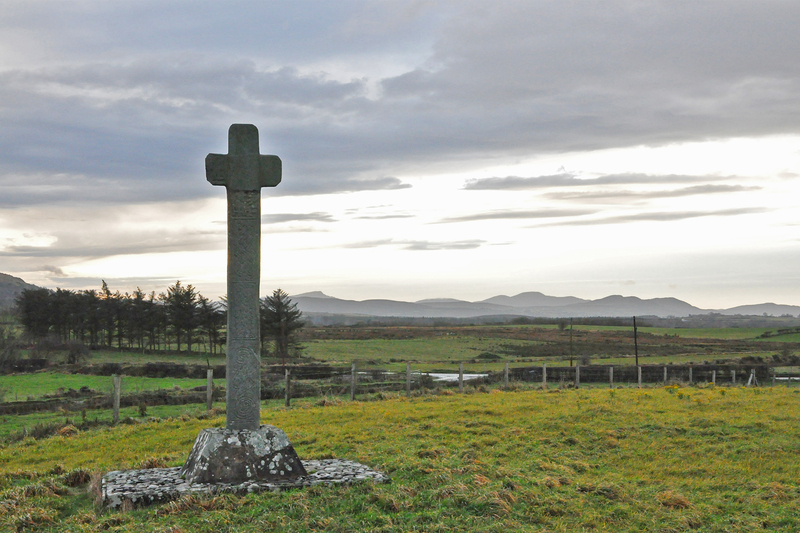 At the site of Carndonagh, there is a High Cross which is known as St Patrick’s Cross, although the area is typically considered to be under St Columba’s area of influence. Anouk stated that it is possible that the site was connected to Patrick because of the alliance between the Cenél nEoghain and Armagh that was established in the early 8th century AD. She emphasized that the stones had been moved quite a bit, and that there is some evidence to suggest that they could have been originally located at a nearby site called “Labby Patrick”. Local folklore dictates that the site was once a healing well associated with St Patrick, and the place is still a place of pilgrimage today. Anouk then drew our attention to the site of Cooley, near Moville, which, according to written sources, has also been dedicated to St. Patrick and is known as a sacred healing site. She suggested that there could be connections between this site and Iona, as several stones recently uncovered by the Bernician Studies Group exhibit crosses with forms similar to some examples found in Iona. Through these comparisons of the stone monuments, Anouk illustrated these potential long-distance connections between the pilgrimage sites of Inishowen Peninsula and the centre of the cult of St Columba (Iona), as well as the centre of the cult of St Patrick (Armagh) emphasized by written sources, although perhaps at different points in time. In her final case study, Anouk focused on the stone known as Aberlemno 2. It has been widely debated whether the scene depicted on the stone represents a historical battle between the Picts and the Northumbrians or a mythical battle. Anouk suggested that if the stone were commemorating an actual battle, the erection of this stone could have been an attempt by a local elite to connect themselves to the major political power of Fortriu (the suggested Pictish power centre during the 8th-9th century AD by Alex Woolf) or even to place themselves under Fortriu’s patronage. While Anouk emphasized that this was by no means a definitive interpretation, the comparative approach used in her research shows that long-distance connections are actually more common than originally believed and allows for new interpretations to be made. Anouk concluded by stating that these early medieval stones created and guided movement through landscape at different scales, whether through a stone’s imagery and inscriptions, the creation of sacred pilgrimage sites, or by connecting these places to major power centres. The theme of movement transcended the geographical specificity of each of these sites. Although the motivations for the raising of these stones undoubtedly differed, the Christian message behind each monument outlived their original commemorative functions. Our seminar series continues next week on 21 February 2017 with Alasdair Whyte (University of Glasgow) to discuss ‘Settlement-Names and Society: the medieval districts of Forsa and Moloros, Mull.’ This will be held in Room 202, 3 University Gardens at 5:30 pm. All welcome!